Fancy-Colored Diamonds—What Makes Them Valuable? When it comes to diamonds, most people think of the colorless variety. But there’s exists whole bevy of colored diamonds that hold just as much value, appeal, and beauty as colorless diamonds – in some cases more. In the gem world, they are known as fancy-colored diamonds. Fancy-colored diamonds come in an array of colors with some colors being the rarest, and therefore, extremely valuable. When it comes to determining the value of fancy-colored diamonds, there are several factors that come into play. Let’s take a closer look at what fancy-colored diamonds are, which colors hold the most value, and how they are valued. To understand what fancy-colored diamonds are, let’s first review what colorless diamonds are, or what the industry calls diamonds in the normal range. Diamonds in the normal range vary from colorless to pale yellow. With these diamonds, the closer they are to being colorless, the more valuable they are. Colorless diamonds are valued using the D-to-Z-grading scale. The higher the letter a diamond is assigned the less value it holds because it has more color. According to the Gemological Institute of America, Inc. (GIA), fancy-colored diamonds are diamonds that exhibit color beyond the Z range (when they are looked at face-up or from the top view). Unlike colorless diamonds, the more vivid, and deeper the color of a fancy-colored diamond, the more value it holds. What Colors Hold the Most Value? Fancy-colored diamonds come in many colors of the rainbow and vary in tone from light to dark. The most common fancy-colored diamonds mined are yellow and brown. The rarest (and most valuable) are red, green, purple, orange, pink, and blue. How Are Fancy-Colored Diamonds Valued? When it comes to fancy-colored diamonds, color is king. According to GIA, as long as a diamond is showing color when viewed from the face-up position (even if it is very light) it’s considered a fancy-colored diamond. 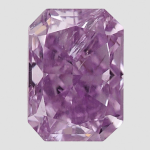 Unlike colorless diamonds, a vivid, saturated fancy-colored diamond holds great value even if it has several inclusions. Why? With only a very small percentage of diamonds mined in the world being of the colored type, vivid fancy colored diamonds are exceedingly rare. As with any commodity, the rarer a diamond is, the more valuable it is. When an expert is grading a colored diamond, they are looking at the hue (the color), tone (lightness or darkness), and saturation (intensity) of the stone. They are also looking for any secondary colors, such as a blue diamond with traces of grey, or a red diamond with bits of orange. As they examine the diamond, they assign it one of the following terms: Fancy Light, Fancy Dark, Fancy, Fancy Deep, Fancy Intense, or Fancy Vivid. The richer the saturation of color, the more valuable it is. Similar to colorless diamonds, the larger a fancy-colored diamond, generally the more valuable it is. However, as mentioned above, the hue, tone, and saturation are paramount. 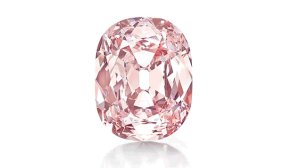 In April 2013, Christie’s flagship Rockefeller Center salesroom, sold a 34.65-carat, cushion-cut Fancy Intense Pink Golconda diamond at auction for $39,323,750. Known as The Princie Diamond, this rare diamond holds the world record for most expensive Golconda diamond sold and the record for most expensive diamond ever sold in the United States. 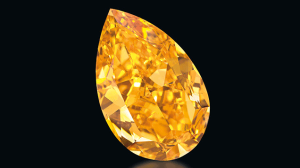 The most expensive orange diamond in the world sold at auction is a 14.82-carat, pear-shaped Fancy Vivid Orange diamond. It sold in November 2013 at Christie’s in Geneva, Switzerland for $35,540,612. Christie’s Geneva also sold an exceedingly rare 1.92-carat rectangular-cut Fancy Red, VS2 diamond for $3,252,670 in May 2013. 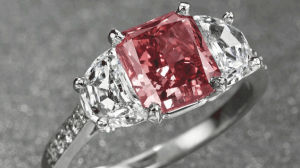 It holds the world auction record for a red diamond. Fancy-colored diamond grading is a complex processs that requires specialized experts. The skill of the grader as well as environmental factors such as the light source used affects color perception, and ultimately the price of your diamond. If you’re interested in selling your diamond, or learning the value of your stone, it’s important to use a well known trusted source such as WP diamonds.